If you would like a collar fitted to one of our FINISHED sticks (NOT KITS OR SHANKS) that you are ordering now, then please select which kind you want. Brass is the standard type but if you want Nickel Silver you can choose below. Having your collar hand-engraved costs only an additional £15 - type the letters and/or numbers in the white box (inside yellow area). We will select lettering we think suits the name or type of stick. COLLARS CAN ONLY BE FITTED TO FINISHED STICKS - NOT KITS OR DIY SHANKS AS THEY ARE UNFINISHED! Leave the box blank if you do not want it engraved. Type name/date etc. that you require in the box. Max 6 characters please (including spaces). (One, two or three lines) FITTED ON STICK. Useful if fitting a collar is not an option. 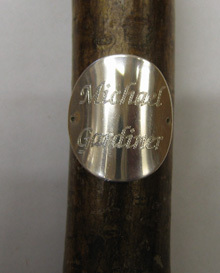 Price £20 for the disc AND the engraving AND the fitting. Type name/date etc. that you require in the box. Max three rows of up to nine characters please (including spaces). The disc is pressed into a shallow curved profile for easier fitting on your stick. Other styles of lettering available on request. If you want ANY OF THE ABOVE to fit on a stick you are making, a stick kit or a shank then YOU MUST NOT USE THIS PAGE! Use the Ferrules Page for collars not fitted to our finished sticks. Please note: Having a collar fitted WILL delay your stick being delivered. It is HARDLY EVER possible to fit a collar to a stick already in stock - it depends on the diameter and taper of the stick - so we will normally make the stick and fit the collar during the process of joining handle to shank. Having a collar engraved normally only adds a few extra days. Obviously it is much easier for us to fit the new silver discs! NB it is not possible to fit collars to the folding sticks - these are bought in from a manufacturer and we are unable to fit collars to them. 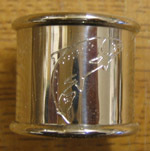 Some of them are made with small, plated collars but we can not have these engraved.